Afonso IV[lower-alpha 1] (Portuguese pronunciation: [ɐˈfõsu]; 8 February 1291 – 28 May 1357), called the Brave (Portuguese: o Bravo), was King of Portugal and the Algarves from 1325 until his death. He was the only legitimate son of King Denis of Portugal by his wife Elizabeth of Aragon. 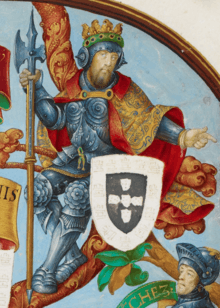 Afonso, born in Lisbon, was the rightful heir to the Portuguese throne. However, he was not Denis' favourite son, the old king preferring his illegitimate son, Afonso Sanches. The notorious rivalry between the half brothers led to civil war several times. On 7 January 1325, Afonso's father died and he became king, whereupon he exiled his rival to Castile, and stripped him of all the lands and fiefdom given by their father. From Castile, Afonso orchestrated a series of attempts to usurp the crown. 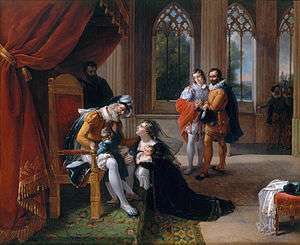 After a few failed attempts at invasion, the brothers signed a peace treaty, arranged by Afonso's mother Queen Elizabeth. ↑ José Miguel Pero-Sanz (19 September 2011). 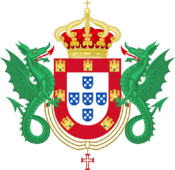 Santa Isabel: Reina de Portugal. Palabra. p. 69. ISBN 978-84-9840-546-0. ↑ One or more of the preceding sentences incorporates text from a publication now in the public domain: Hannay, David (1911). "Alphonso s.v. Alphonso IV.". In Chisholm, Hugh. Encyclopædia Britannica. 1 (11th ed.). Cambridge University Press. p. 733. 1 2 Sousa 1735, p. 312. 1 2 3 4 5 6 7 8 9 Rodrigues Oliveira 2010, p. 217. ↑ Rodrigues Oliveira 2010, p. 215. ↑ Lourenço Menino 2008, p. 356. 1 2 3 4 5 6 7 8 Sotto Mayor Pizarro 1997, p. 201. ↑ Sousa 1735, pp. 317 y 322. ↑ Rodrigues Oliveira 2010, p. 218. 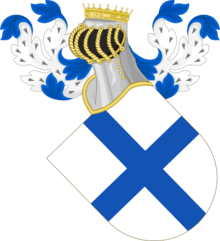 1 2 3 Sousa 1735, p. 315. ↑ Rodrigues Oliveira 2010, pp. 228-229. ↑ Rodrigues Oliveira 2010, pp. 217, 220.